Christchurch, New Zealand — February 2011: Volunteer Ministers distributed 14 tons of food and supplies and helped more than 21,000 after the earthquake. Japan, 2011: Hundreds of Volunteer Ministers from around the world traveled to Japan to help the country recover from the March 2011 earthquake and tsunami. Japan,2011:Hundreds of Volunteer Ministers on the ground in the tsunami zone have been working in evacuation centers and shelters providing assists and helping people in every imaginable way. Japan—March 2011: Scientology Volunteer Minister confronts the task at hand after the tsunami. Birmingham, Alabama—April 2011:Volunteer Ministers help Alabama residents locate their possessions and clean up their neighborhoods after devastating tornadoes leveled entire sections of Birmingham and Tuscaloosa. Joplin, Missouri—May 2011: a three-quarter mile wide tornado struck the city of Joplin, Missouri, literally leveling it. Volunteer Ministers from St. Louis and Kansas City provided assists and helped residents recover cherished possessions from the wreckage. The Scientology Volunteer Ministers who served at Ground Zero in the months following 9/11 set a standard for disaster response and inspired a movement that carried forward for the past decade. Here is an overview of the work of Scientology Volunteer Ministers so far in 2011. After years of devastating drought in Queensland, Australia, torrential rains brought the worst floods in over 30 years, swamping 20,000 homes across the city. Volunteer Ministers cleaned out sludge-filled homes, unblocked key areas obstructed by debris and mud, and gave assists to exhausted relief workers. 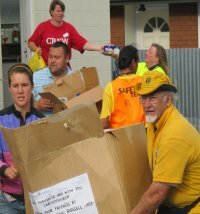 When a 6.3 earthquake struck Christchurch, 10 kilometers from city center, Volunteer Ministers were on the ground within 48 hours helping in the search and rescue effort, distributing supplies, delivering supplies door-to-door. In March, when a 9.0 magnitude earthquake off the coast of Japan unleashed a 30-foot tsunami, the first team of Volunteer Ministers left for the disaster zone from Tokyo within 24 hours. The Church of Scientology flew in a highly specialized VM-trained search and rescue team from Mexico known as Los Topos. Despite concern over radiation levels from damaged nuclear power plants, Japanese Volunteer Ministers were joined by teams from seven countries who brought emergency equipment, medical supplies, food and tents. Hundreds of Volunteer Ministers on the ground in the tsunami zone have worked in evacuation centers and shelters, ever since, providing assists and helping people in every imaginable way. They even organized the donation of a fleet of bicycles so junior high school students could to deliver food and supplies to elderly neighbors stranded in their homes. At the end of April, a series of tornados swept through several U.S. states in the South, Midwest and East—in Alabama, 150 tornados touched down over a 24-hour period. Four VM teams drove to the worst hit locations. Taking part in the massive cleanup operation, they went house to house to provide whatever was needed. On May 22, a three-quarter mile wide tornado struck the city of Joplin, Missouri, literally leveling it. 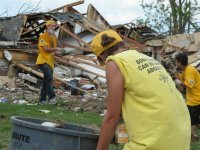 Volunteer Ministers from St. Louis and Kansas City provided assists and helped residents recover cherished possessions from the wreckage. The Scientology Volunteer Minister program was initiated by Scientology Founder L. Ron Hubbard in 1976. And through the course of providing disaster relief in just the past 10 years, Scientology Volunteer Ministers have trained and partnered with more than 1,100 organizations, including the Red Cross, FEMA, National Guard, Salvation Army, Mexico’s International Rescue Brigade, Boy Scouts and hundreds of local, regional and national groups and organizations, giving freely of their skills, their care and compassion. Today there are hundreds of thousands of people trained in the skills of a Volunteer Minister across 185 nations. For more information on Scientology Volunteer Ministers visit www.volunteerminister.org.